If your child is in high school, it's never too early to start preparing for the future. Here are a few things to keep in mind to get the process started or keep it moving. We offer an orientation just for parents and guests. While your student is at New Student Orientation, parents have their own orientation with topics tailored to meet your specific needs and concerns. The program was established to provide opportunities for students to measure their readiness for college-level English and mathematics in their junior year of high school, and to facilitate opportunities for them to improve their skills during their senior year. 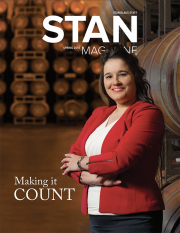 In this edition, we meet Stan State alumna Arleen Wallen, who is making her degree count as the controller at Bronco Wine Company. With the adoption of a new University Strategy Plan, this issue of STAN Magazine examines each of the five goals of the plan, which is uniquely structured using overarching themes. We also highlight news about a $1.6 million gift to the University that is supporting a new family nurse practitioner master’s degree program. 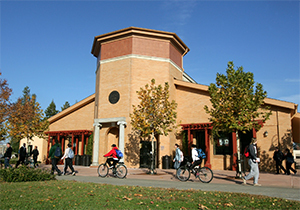 In addition, you will find stories about Stan State’s new Technology Enhanced Active Learning Classrooms, the dedication of the Dr. Marvalene Hughes University Reflecting Pond, faculty research in agriculture and biology, as well as a story about students’ experiences learning about sustainable agriculture from visiting Italian farmers.